Located along the northwestern boundary of Killearn Estates, one can find wildly popular Shannon Forest, with roughly 280 homes that have been consistent performers among the top selling neighborhoods in the Tallahassee real estate market. 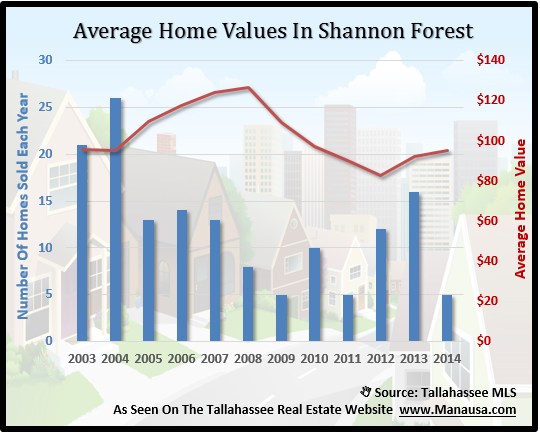 While not producing sales numbers like the top five subdivisions (Southwood, Golden Eagle Plantation, Killearn Estates, Killearn Lakes Plantation and Bull Run), Shannon Forest does see enough home sales to often times drop into the top 20 most active neighborhoods in the Tallahassee MLS. Thus far in 2014, Shannon Forest ranks tied for #11 based upon 5 home sales with an average sales price of $192,500 and a value of $95 per square foot. That means you are getting a 2,027 square foot home for just over $190K in a highly desirable NE Tallahassee neighborhood. Currently, there are 6 homes for sale in Shannon Forest, 2 of which are already under contract. Similar to what we recently reported about home sales in Woodland Drives, we see that average home values continue to rise since the bottom of the housing market in 2012. The increase in unit sales and in home values is a good sign for value recovery in Shannon Forest. Average home prices have been rising over the past two years as well. 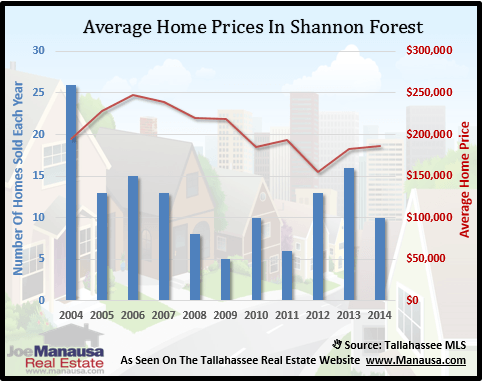 With only 1 distressed home sale recorded in the past year, it is not surprising to see both average home prices as well as average home values recovering in Shannon Forest. The following map shows the Shannon Forest homes that are on the market today. If you want more information on a particular home, simply click on the marker on the map and it will open up the listing to show you up to 25 pictures of each home. The following is a list of all homes sold in Shannon Forest (recorded in the Tallahassee MLS). I hope you were able to learn something from this Shannon Forest Home Sales Report, please drop me a note if you have any other questions or concerns that I can help you with.